Forsyth County is consistently first-in-class on one key metric: its residents’ health. This is according to a recent study by the University of Wisconsin Population Health Institute and the Robert Wood Johnson Foundation, which is America’s largest philanthropy solely focused on health. Out of the 159 counties in Georgia, Forsyth County ranked number one in terms of overall health. And not only has Forsyth County ranked first in the 2019 rankings, but it has ranked first in every single year since 2013. There is not one clear answer on why Forsyth County residents are so healthy. That said, it is clear that something amazing is occurring in the county. By further examining this new study from the Robert Wood Johnson Foundation, one can get a better sense of what makes Forsyth County residents so healthy. To get a better sense of this accomplishment, it helps to dig into the data. The Robert Wood Johnson Foundation study gathered data and ranked every Georgia county in several subcategories. Those subcategories include length of life, quality of life, health behaviors, clinical care, social and economic factors, and physical environment. Forsyth County is not ranked as number one across each of these subcategories, but collectively, it came out on top. As for these subcategories, Forsyth County ranked first in length of life, first in quality of life, first in health behaviors, seventh in clinical care, second in social and economic factors, and thirty-ninth in physical environment. Fortunately for Forsyth County residents, there is plenty of good news. Forsyth County is stellar in length of life, quality of life, health behaviors, and social and economic factors. The county has one of the country’s lowest premature death rates. In fact, Forsyth County’s premature death rate is about 25 percent lower than some of the top U.S. performers on this metric. It is nearly 100 percent lower than the average rate throughout the state of Georgia. Forsyth County residents can also be happy about their quality of life, as the number of residents with poor or fair health, poor physical health days, poor mental health days, and low birthrate is in line with some of the best performing counties in the United States. Their health behaviors are second to none in the state, as Forsyth County residents have low rates of adult smoking, adult obesity, physical activity and teen births. The county’s rate of alcohol-impaired driving deaths is lower than even some of the top U.S. performers. While Forsyth County isn’t perfect in the quality of life metrics (the county’s higher excessive drinking rates and average obesity rates when compared to other Georgia counties), the county is a great place for individuals and families who want a high quality of life. Forsyth County’s social and economic metrics are also stellar. The high school graduation rate is well above the Georgia average (94 percent compared to 81 percent) and 50.2% of Forsyth County residents have obtained a bachelor’s degree. The unemployment rate is nearly one percent lower than the Georgia average and income inequality, once again, is lower than in many counties throughout the state. Forsyth County is a great place for children as well. There are significantly fewer children in poverty in Forsyth County compared to other Georgia counties (and even top U.S. performers), along with significantly fewer children in single-parent households versus other counties throughout the state. Finally, violent crime and injury deaths are lower in Forsyth County than in other counties. This is all terrific news and goes to show that Forsyth County is an attractive place to live. However, the data also provides county healthcare champions with areas to target strategic improvement initiatives. The two main areas of improvement showcase in the data are in clinical care and physical environment. With clinical care, Forsyth County is starting from solid ground, as it is ranked seventh in the state. The main struggle appears to be access to medical care. While there are less uninsured in Forsyth County compared to other Georgia counties, there are less medical professionals available per resident. Specifically, there are significantly less primary care physicians per resident (2,800:1) compared to other Georgia counties (1,520:1) and the top U.S. performers (1,050:1). The same is true of dentists and mental health providers. In addition to clinical care, however, Forsyth County could improve in the “physical environment” category. The county has more air pollution than many other Georgia counties (and significantly more pollution than the top U.S. performers). Forsyth County residents also experience stress related to their drives and commutes. Not surprisingly, the data shows that Forsyth County residents are much more likely to drive alone on long commutes compared to other Georgia counties (and significantly more than the top U.S. performers). With all of that said, however, the positives vastly dwarf the negatives in Forsyth County. 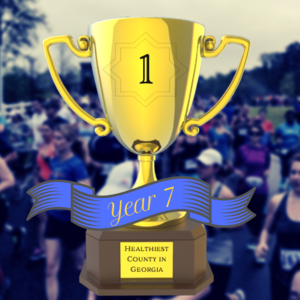 Forsyth County has much of the data on its side and has been ranked the healthiest county in the state for seven consecutive years. The data is certainly compelling. However, you may be wondering why Forsyth County consistently outpaces its sister counties in the rankings. The answer is unclear. One simple explanation may be that county officials prioritize the overall health and well-being of the community. This isn’t saying that other Georgia counties don’t care about their residents’ health. However, Forsyth County officials are willing to invest in parks, programming, and other assets to improve overall health. The county has a significant amount of green space, walkways (including 45+ miles of trails) and exercise opportunities that residents can leverage. Notwithstanding this positive news, county officials understand that there is more work to be done. The county is working to tackle health care issues (particularly, bringing in additional physicians to serve county residents). As for health care, there has also been an increased push for preventative care, so that medical issues are solved before requiring hospitalization. Whatever the reason (or reasons), Forsyth County residents are in a terrific position. While the county is not perfect, residents’ health continues to be exemplary. It is unclear if these stellar marks will continue in the future. However, if the past is prologue, Forsyth County residents can remain optimistic about the future. See other facts about Forsyth County here. Also, see how this compares to last year and why Forsyth is continuously ranking so high on health here.